What is the SEO title? Your SEO title will be visible to people who are not on your website yet. It will be shown to people on the search engines’ results pages as the title of your snippet, and it can, therefore, be different from the title of your post or page. What does the SEO title width check do? This check assesses the length of your SEO title. If you haven’t created any SEO title yet, the assessment will remind you to do so. You will also receive a bad score if your title is too short and you are not making optimum use of the space. It is no good either if your SEO title is too long. In this case, search engines won’t be able to show the entire title. Why is the SEO title important for SEO? Your SEO title will be the first thing potential visitors of your site see on the search results pages. And, if your title is not good enough, it’ll also be the only thing they see. So, the purpose of your SEO title is to make people click on the snippet, come to your website and read your post or buy your product. To increase the odds of that happening, you want to make sure your title is compelling: enticing, not too short and not too long. What’s more: if Google doesn’t think your title is good, it’ll generate one itself. That’s not necessarily a bad thing, if it’s ranking your page for a specific query and adapted your title to fit that query better. But it can be an indication of your title not being good enough: for instance because of keyword stuffing, or because it lacks your brand name and focus keyphrase. Do you want to improve your SEO title? 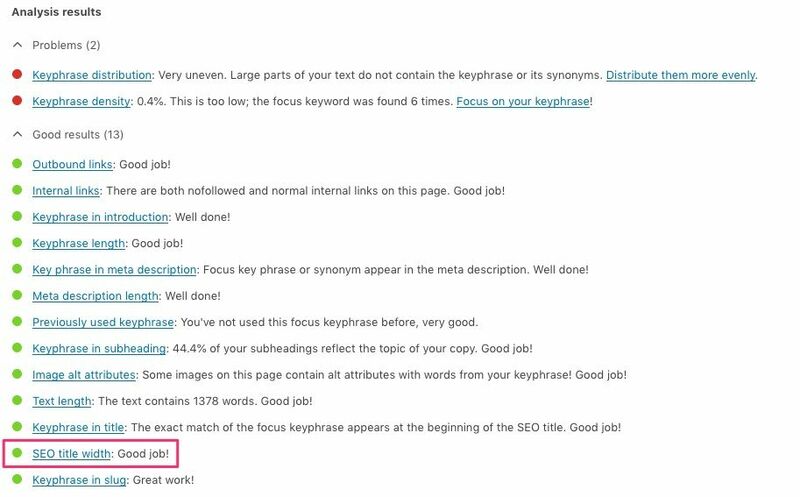 Yoast SEO automatically generates an SEO title based on the title of your post, the H1 heading. It will also put your site’s name in the SEO title and a small bullet to separate the post title from the site name. You can change how the plugin generates the SEO title under ‘Search appearance’, for example, if you want it to automatically add a post’s category or a dash instead of a bullet. Keep in mind that removing your site’s name isn’t a good idea: titles will usually be rewritten by Google if they don’t contain branding. In many cases, these automatically generated SEO titles will suffice. But it never hurts to consider whether your post’s h1 heading is also the best title to get people to your site, and if it includes the right keyphrase. If you want to add a handcrafted SEO title to your page or post, you can just add it in the SEO title field. You may want to do this, for example, when you’re targeting two variations of a keyphrase with a post, to work both into your SEO title. For product pages, the h1 heading may also not always be the best SEO title. In any case, it’s important to make your titles enticing, make sure they include your focus keyphrase, without keyword stuffing, and your site’s name. The SEO title width check will help you make sure it has the right length!